After more than two years of construction the doors opened to the new building June 12, 2004. The current ICPL location is an expansion and renovation of the 1981 building, its current space nearly double that of the original. A successful November 2000 bond referendum vote helped in funding this project. The design of the current building, with its tall windows and additional seating, is a marked change from the earlier building. Self-check features were also installed during this building's renovation. 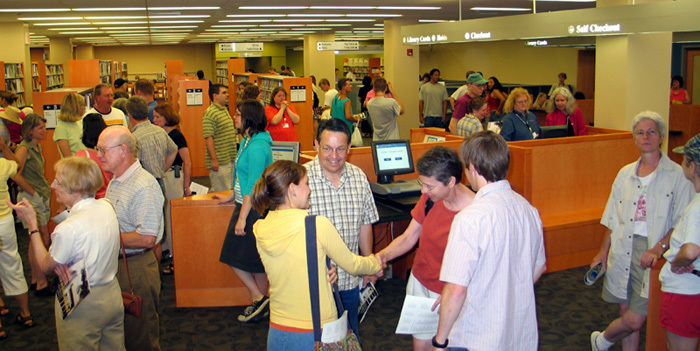 “Library Building Grand Opening, 2004,” Iowa City Public Library, accessed April 19, 2019, http://history.icpl.org/items/show/202.